At the Department of Energy’s Manufacturing Demonstration Facility, a research team achieved a 500 percent increase in thermal conductivity using a thermoplastic composite made of copper fibers mixed with nylon. June 5, 2017 – Reducing the energy and water that power plants require to convert heat to electricity could become easier with a novel heat exchanger designed and 3D printed at Oak Ridge National Laboratory. A research team achieved a 500 percent increase in thermal conductivity using a new thermoplastic composite made of copper fibers mixed with nylon. Developed in collaboration with the University of Wisconsin, the material and design can be used in creating heat exchangers for other applications as well. 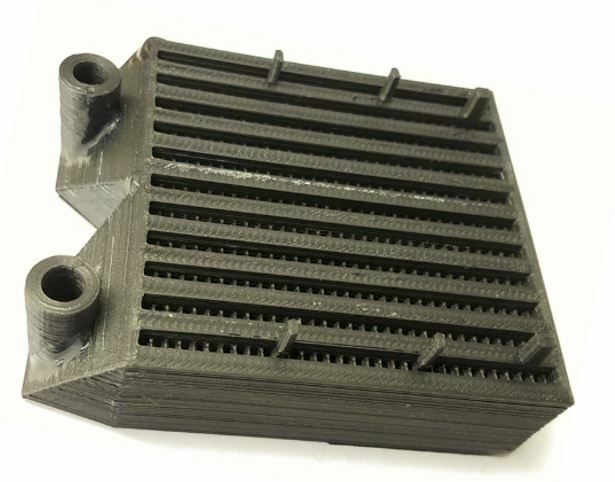 “Additive manufacturing gives us the flexibility to customize the heat exchanger for the task, tailoring the design and scaling the size as needed,” ORNL’s Vlastimil Kunc said.